Polyurethane is a highly elastic, cold-hardening coating without plasticiser, that hardens to a seemless, jointless, long-lasting and watertight membrane. This material distinguishes itself by an extremely strong adhesion on almost all building materials like concrete, wood, stone, metal, plaster, bitumen and much more. The membrane follows the temperature-related movements of the subsoil without cracking thanks to its high elasticity within its technical values. Mechanical damages can be easily repaired without great effort. In spite of the excellent watertightness the material is permeable to water vapour. This means, also a humid subsoil can dry off by diffusion after coating. Compared to other waterproofing coatings, e.g., acrylate dispersions, a polyurethane coating can be also applied on surfaces which are permanently underwater. 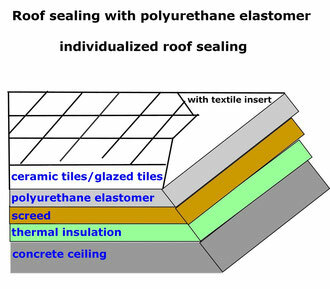 Connections, roof breakthroughs or dry, cracked and porous subsoils are reinforced with fabric. After already 1 hour the material is rainproofed. Flat and slanting roofs, foamed roofs, metal roofs, balconies, terraces, flower tubs and much more. waterproofing-works carried out by us!